Historically, effects-loving guitarists were split into two camps: those who were pedal users and those who were rack gear users. And while today it’s quite common to find pedals incorporated into complex rack systems, the pedal-only crowd is still as strong (and large) as ever. The funny thing, though, is that there are a growing number of pedal users who are really turning into rack folks without even knowing it. Case in point — anyone using the new line of Eventide Factor pedals! Call these what you want, but if you’re playing with the fantastic sounding ModFactor pedal (the subject of this review) or the TimeFactor (see review here), you’re practically there. Consider yourself a rack user’s kissing cousin! These impressive pedals place rack-quality effects gear at your feet, complete with full programmability, MIDI control, and more. The Eventide ModFactor is a great sounding and extremely versatile modulation effects processor — it seems almost demeaning to call it a pedal. And don’t think “chorus pedal” either, because that’s just one small part of this chameleon. The ModFactor offers choruses, phasers and flangers, tremolos and wahs, and more. 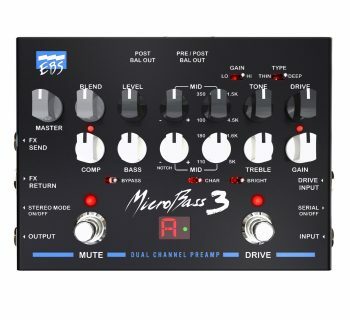 With stereo inputs and outputs, deep programmability, external control via MIDI or expression pedals, and memory for up to forty sound presets, it really is like putting rack gear at your feet. 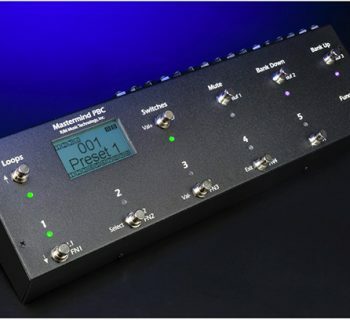 But while traditional Eventide rack gear requires a serious dedication to programming, the ModFactor has a simple user interface that lets you cover the basics in a matter of minutes. Of course once you’re ready to embrace its advanced capabilities, you’ll find that the pedal offers programming options that rival what you’d expect to find in popular rack gear. Given the variety of effects, you’ll definitely want to use an expression pedal with the ModFactor. The pedal features not only stereo output, but also stereo input — especially handy if you’re using the ModFactor in a loop with rack gear or other Eventide stereo effects pedals. Additionally, there are input- and output-level switches for guitar or line-level operation, making it easy to optimize your signal level whether the pedal is in front of your amp or in an effects loop. The all-metal construction and rubberized knobs seem quite sturdy, while the program selection/On-Off and Tap Tempo controls utilize familiar Carling-style switches. The pedal features true analog bypass, though you can set the pedal for buffered operation if you prefer. Independent of this, the pedal also offers a selectable Kill Dry feature, which will be of additional benefit to players with parallel-wired effects loops (in other wiring scenarios, enabling Kill Dry will cause the pedal to completely mute its output when an effect is bypassed). Besides the Tap Tempo button, the ModFactor also responds to clock sync via MIDI. There’s an input jack for an expression pedal, a USB port, an auxiliary quarter inch input jack, MIDI In/Out jacks, and a standard power connection for use with the included 9V DC power supply or connecting to your pedal power system. 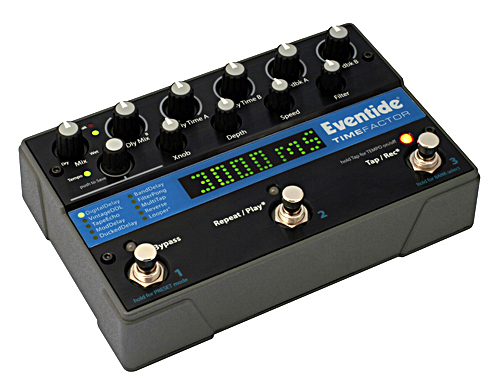 The USB port enables Eventide to provide software updates to their pedals via your computer and the Internet. You can also backup and restore your presets to the computer with an appropriate MIDI SysEx utility (see the Eventide website for details). The ModFactor has a special Catch-up feature that is essential if you are using the pedal for real-time sound manipulation. Keyboard players in particular will love this feature, assuming the pedal is sitting on top of one of their keyboard controllers, though it is of limited value to a guitar player. It works like this: imagine that you select a flanger preset that has a very slow rate setting and you want to increase the rate just slightly, but the Rate knob happens to be set to 3:00. Touching the knob would immediately make the rate jump from slow to super-fast. If you enable the Catch-up feature, nothing would change in your sound until you rotated the Rate knob down past the preset’s stored value, and then once “aligned” with the saved value, the knob would take over increasing or slowing the effect rate. Great feature, but again, most of us won’t need to make use of it. The programmable expression pedal input is equally impressive. You can control multiple settings in the ModFactor concurrently from a single pedal. There is plenty of configurability here since you can define the upper and lower ranges of the pedal control independently for each setting you’re planning to adjust. The Slow/Fast and Brake footswitch controls are of use primary to players interested in using the Leslie effects. Pressing the Slow/Fast button on the rotary effect simulates the effect of slowing down the rotation of the Leslie speaker (technically, by slowing down an LFO). The closely-related Brake mode slows the LFO while you depress the button, and then it speeds up again when you take your foot off the switch. The auxiliary input jack can be programmed for use in numerous configurations, and it supports up to three momentary pedals connected using Tip, Ring, and Tip + Ring (note: you can’t use latching pedals). Some likely uses for these extra foot switches would be to provide a dedicated Tap Tempo input, or for instantly switching the pedal’s operational mode between Bank Select and Play modes. You can also use momentary switches to toggle between two parameter values in your effect. Really, the ModFactor is just as programmable as any piece of rack gear you might be contemplating for your effects. 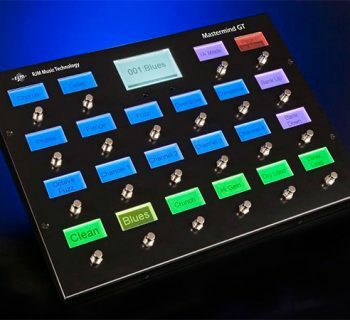 Basic operation of the ModFactor is straightforward, despite the plethora of knobs and switches you’re confronted with. There are two modes of operation — Bank Mode and Preset Mode. In the default Bank mode, the right-most button selects a bank of sounds from 1 to 20, while the left and middle buttons choose one of two different sounds within that bank. Stepping on a button switches from one preset to the other, and stepping on the same button turns that effect On or Off. This provides the quickest access to the widest range of saved sounds unless you’re patched into your MIDI rig, but it doesn’t leave you with instant access to the Tap Tempo feature. We plugged in an external BOSS PS-5U switch and configured it for use with the Tap Tempo feature so that we could leave the pedal in Bank mode and still have instant use of this feature. Holding down the Bank button switches into Preset mode. This gives you access to only a single sound (whichever one you had been on from Bank mode), and here the buttons work (from Left to Right) as On/Off, Slow/Fast or Brake, and Tap Tempo. The knobs on the ModFactor should be looked at as belonging to three primary clusters: the first, containing Intensity and Type, sets the overall effect intensity and let us select the type of effect being used. The second cluster would be the top row of knobs that control Depth, Speed, and Shape — basic controls for typical modulation effects. The third cluster contains the D-Mod, S-Mod, Mod Rate, and Mod Source knobs, which can be thought of as providing advanced modulation of the primary sound effecting controls. There is another knob for dialing in tempo, saving sounds, and the Xnob knob, which serves a different function depending on the effect being used. Page 19 of the User’s Manual has an important reference chart for using this control. Programming some of the pedal’s advanced capabilities was slightly challenging, and took some repeated reviews of the documentation to figure out, but we were able to do some cool things overall. In one case, we configured our Boss FV-500H expression pedal for use as a simple wah pedal, but instead of covering the full range of the effect, we limited the adjustable range of frequencies to our desired taste. Because these settings were saved on a per-preset basis, we could configure multiple similar (or different) wah sounds that each responded differently to our pedal work. In another case, we assigned multiple parameters to the expression pedal for simultaneous control so that stepping on our expression pedal changed the effect’s intensity and rate, getting louder and faster as we raised the pedal. The pedal assignments were actually one of the simplest things to adjust for in the ModFactor and didn’t require getting mired in the deep programming menus. We simply stepped on our expression pedal to a fully heel-down position and adjusted a desired parameter knob for the desired Low value, then we raised the pedal to its full Up position and adjusted the same knob to our preferred maximum value — that’s it! And because the minimum and maximum values for each parameter are set independently, we were able to create some truly personalized effects. The ModFactor is a wolf dressed in sheep’s clothing, not just in terms of the functionality, but in the way it sounds. This isn’t pedal fodder… it’s rack-worthy tone cleverly tucked away inside a pedal. Modulation effect pedals tend to fall into modern or retro camps, and as you might expect from a company with Eventide’s legendary studio pedigree, the ModFactor falls clearly into the modern category. This is a pedal for players seeking pristine audio signal paths with minimal or no coloring of their sound. Sure, there is some irony in seeking a lack of color from your phaser, but hey, we know players like you! Seriously, this isn’t a pedal to give you tone that is warm and creamy — leave the coloring to your boutique amp. The ModFactor is going to modulate your signal without getting in the way of your tone. And it does so quite beautifully. We used the ModFactor with a Mesa/Boogie Road King II rig to hear how it sits in a nice high-end, high-gain amp setup, and we also ran it through our Mesa/Boogie Triaxis/2:Ninety rig since that operates in full stereo and delivers more of that Mark-series liquid tone. In both cases, this pedal sounded best when run through the effects loop. Modulation effects can sound good there or in front of an amp, but given the studio-quality nature of this pedal, we consistently found our best sounds when using the ModFactor in our loop. Unfortunately, that made use of the wah-wah effects less exciting but delivered the other effects beautifully. We’re big fans of clean, modern choruses because they sound great either clean or when applied to high-gain tones (call us ‘80s throwbacks — we can take it). The chorus produced by the ModFactor was clean and rich without being overbearing or sounding too much like a flanger. For that, we had actual flanger effects, and while those were of comparable quality, we preferred the phaser effects even more for our swooshing sounds. Vibrato worked fantastically well. Because the pedal is so clean, it was really like getting vibrato straight from an amp head — there was no masking of our tone. Many of the other effects, like ring modulation and rotary speaker, have more specific applications that won’t appeal to the broadest audience, but if you love creative sound effects, wait until you step on our favorite of the bunch… the Undulator effect! This classic Eventide effect (a blend of two delays, detuned voices, and tremolo) turns your guitar into a new-age synthesizer and is almost worth the price of admission for the ModFactor on its own. Most of the effects worked effectively in our mono rig, but if you’ve got a stereo rig like our Triaxis/2:Ninety, the effects take on even larger personalities that will surely bring a smile to your face. The Eventide documentation is almost great, but it has some surprising omissions. The user’s manual provides detailed instructions governing how to customize the myriad number of settings for MIDI control, external pedal switches, etc., and provides numerous connection illustrations for use with combo amps, effects loops, and mixers, but it really fell flat on the basics! There was barely an explanation of each effect, and no explanation of the different sub-categories within each effect (like how the Positive Flanger differs from the Thru-O Flanger, for example). 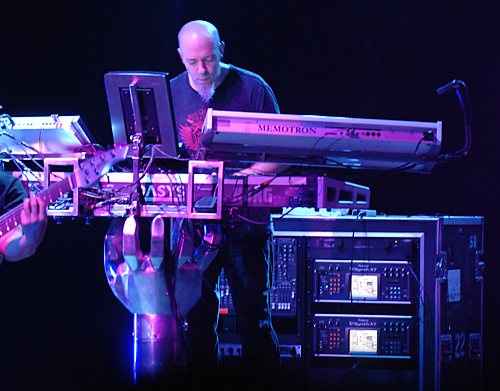 The explanations were also lacking terms of knowing just how many parameter knobs really make a difference within each individual sound — some of the secondary controls seemed to have more limited influence on certain sound effects. And finally, mentioning that some controls are used for the LFOs, amplitube modulation, and frequency modulation is of very limited value to guitar players — particularly without an explanation. Better real-world descriptions of some of the parameters would be useful to the majority of guitarists, and some application tips would have come in handy. 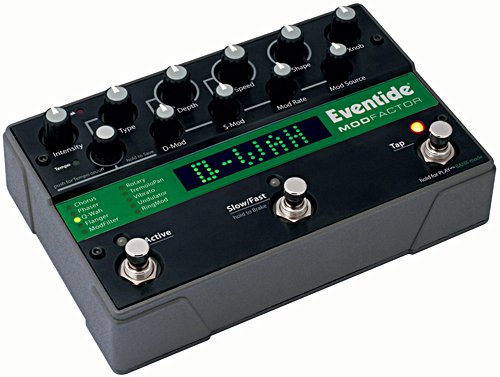 The Eventide ModFactor (MSRP $499) sells for approximately $400, a great deal if you consider that you’re getting a “Baby Eventide” rack unit that fits on your pedalboard, though of course, it’s a bit more than if you were just shopping for an individual chorus pedal or phaser.